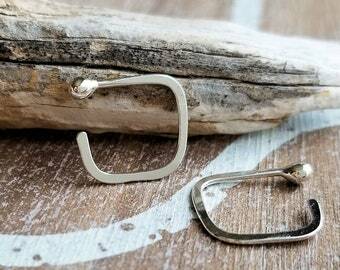 A tiny pair of Argentium Silver square hoops for a cartilage piercing or wherever works for you. 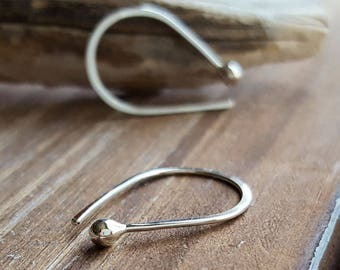 I create these endless hoop earrings with 18g Argentium Silver, file for comfort, hammer and finish with a tumble polish. To wear, gently twist apart side to side, insert the hoop from the back or front then twist closed. 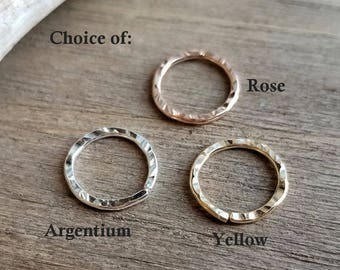 Argentium Silver is hypoallergenic, highly tarnish resistant (with proper care), brighter than white gold or platinum, purer than sterling silver, and is made from certified recycled silver. It is actually closer to fine silver. 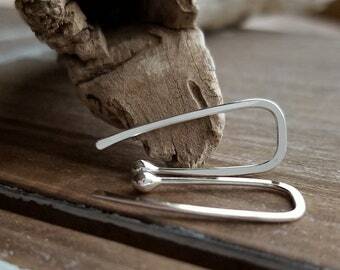 My metalwork is handmade to order for each customer and not kept in stock. Due to my work is entirely handmade, please allow for possible slight variations from the representation photo shown. Please read my Shop Policies for processing time and details. Scroll down for FAQ's. Standard lobe piercing: 20g is considered the norm, but these are made with 18g (the lower the number the thicker the wire). Can't find your size? See my shop for other listings in either 20g or 18g jewelry or contact me. See my FAQ's for more info. Thank you for your support of handmade! A+++ metal work! Great experience.. Thanks! 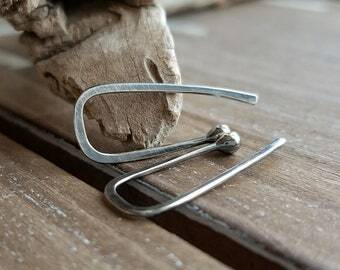 All of my listings include a detail description of the item, measurements, type of metal, gauge of wire and finish. 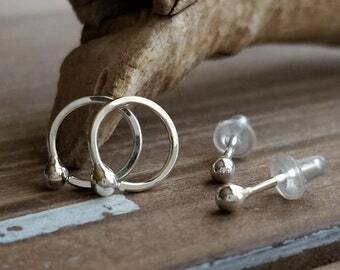 All of my earrings are created with 20g (for standard ear piercings) and 18g (thicker than 20g). 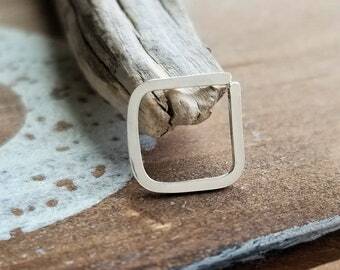 Photos of jewelry on a ruler show the measurements in centimeters, millimeters and inches. I take all my photos up close and in natural lighting, but due to computers, cellphones and tablets vary, sizes and colors may appear larger/smaller or lighter/darker than they actually are. Please know that I do my best to describe them as much as possible. Can you model the earrings and send me a photo? Apologies, but I do not model the earrings, plus most of my work is made to order. However, I do provide photos, measurements, and as much detail as possible in each listing. What metals do you use? Is there nickel in them? All the metals I use do NOT contain nickel. What is inner diameter and outer diameter? 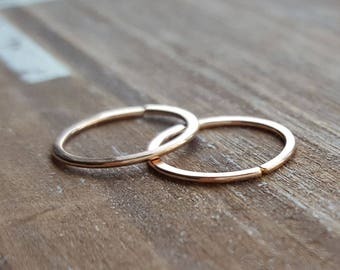 Inner diameter (ID) is the inside measurement of a hoop ring and outer diameter (OD) is the outside measurement of the hoop ring. 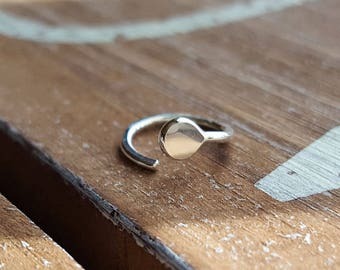 What size nose hoop do I need? If you’re not sure what diameter size hoop you need and don't have a caliper, you can measure it with a metric ruler. 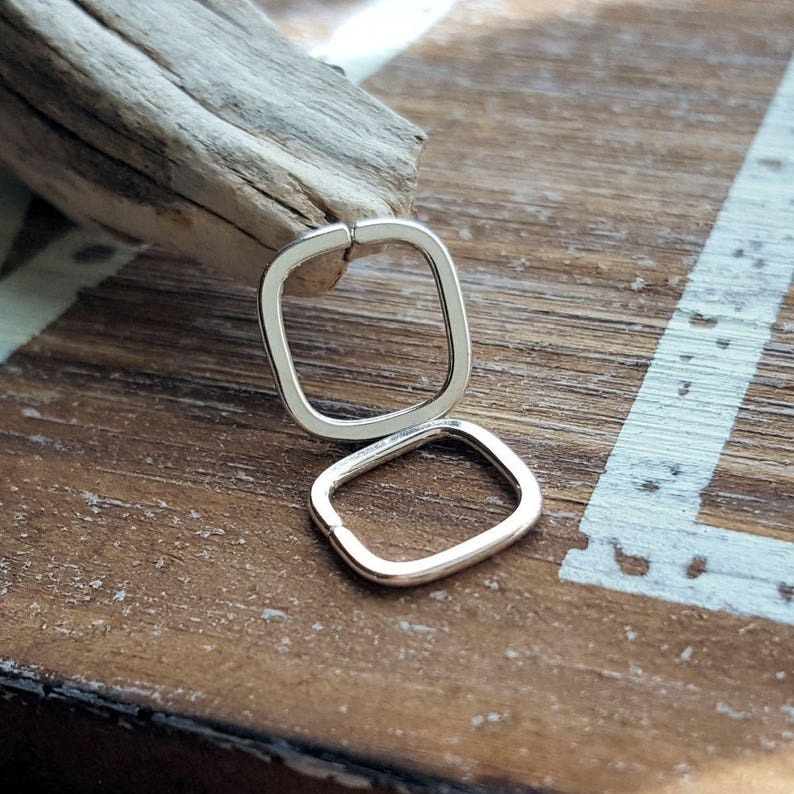 Place the ruler on your nose and measure the distance between the piercing hole and the edge of your nostril, then add a millimeter so that the ring isn’t resting against your nostril. Or you can go to any piercing shop and have them measure for you. The measurement taken will be the inner diameter needed. 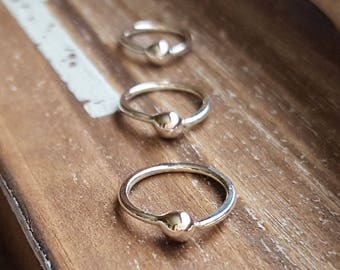 I wear an 18g 8mm ID nose hoop, but it depends on how far up your nose piercing is on what works for you – and your preference. 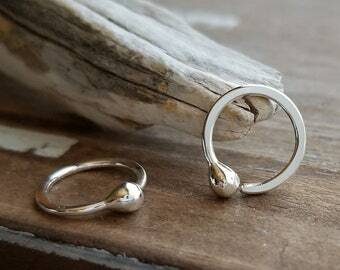 I’ve had some customers tell me they like to wear tight fitting nose hoops and others wear bigger diameter hoops. Most jewelry will eventually tarnish, but with proper care you can keep it looking good for a long time. - *most tarnish can be removed with either store bought products (polishing cloth, etc.) or homemade recipes. Because there are a ton of remedies, I suggest looking online for the applicable cleaner. 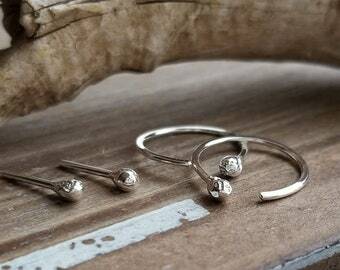 *for jewelry that has been oxidized/antiqued, do NOT use any cleaner as that will remove the intended oxidation. 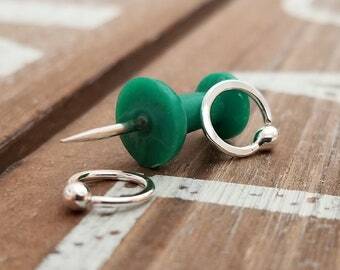 Note: if you are allergic or have sensitivities to certain metals, it will cause the earring and/or piercing to turn black/green. Please consider this before purchasing as the jewelry cannot be returned. Do you do custom work or reserve orders? Please contact me and we'll work together on it. Custom and Reserved orders must be purchased and paid for in full prior to being scheduled for processing. Due to their nature, these are non-refundable. Large orders require addition time to create. What if my order is lost or damaged? Customer satisfaction is important to me. I package orders with care & attention and like you, expect it to arrive in a timely manner and in the same perfect condition as shipped. However, if your package is lost or damaged (photos required), please contact me and I will be happy to work with you on a resolution. You will not be left empty handed. Please contact me within 7 days from receipt of your order and I will handle any concerns with immediate attention to resolve it. Mail back to me (in the same excellent condition as I shipped it) within 14 days. I will issue a refund (less original shipping cost) once I receive the item back. If it was my error, a full refund will be issued. Nose Jewelry and Custom Orders are not refundable. STUDIO HOURS: Mon-Fri 8am-4pm (MST). Closed on Weekends & Holidays, however I will respond to messages as soon as I can. FLAT RATE SHIPPING - no additional cost on multiple items. Due to Buyer/Seller Protection Policies, I cannot ship to an address other than listed on the transaction & payment receipts (must match). Orders ship via 1st Class Mail w/Delivery Confirmation (where applicable). I email my customers after purchase with more information. © Copyright 2007-2019 Rocki's Artisan Metalwork. All rights reserved including my designs, photos, item descriptions and any other written text contained within my shop.